What has the Legislature done for the citizens of Texas this week? You left an Israeli flag on your reception desk? You are from Belton, Texas. Are there any Jewish people who actually live there? I am somewhat confused here. Are you representing the district in Texas or some place is Israel? You want the Muslims to say the pledge of allegiance to the United States. You do realize you are a representative in the Texas legislature and not in Washington, D.C., don’t you? Wouldn’t it be more appropriate for people visiting to say the Texas pledge of allegiance? I mean you, as in the Legislature, mandated that every school child in Texas say the Texas pledge, so why not capitol visitors? While you are at it, why don’t you have them sing the state song too? You do know it is Texas Our Texas and not The Eyes of Texas? Have the Muslims sing The Star Spangled Banner too. Perhaps if they sing America, the Beautiful and My Country tis of Thee you can enjoy an entire choir. Perhaps reciting the Preamble to the United States Constitution can fit into your interrogations. A nice paper to accessorize the Israeli flag might the Ten Commandments. I mean after all, the Protestants got them from Jewish people. The event, Texas Muslim Capitol Day, was organized by the Texas chapter of the Council on American-Islamic Relations. You are aware this was to promote positive relations between the United States, of which Texas is a member, and Islam? And last, but not least, not all Muslims are terrorists. Kyler Murray may be one of the best athletes in the state of Texas or maybe in all of college football. The Dallas Morning News listed five reasons why Kyler Murray should choose Texas A&M over that other school in Austin. You can read the entire article from Brandon Wheeland, but if you just want my cliff note version, here are my reasons why Kyler Murray should attend Texas A&M. There are thousands of Former Students who long for a National Championship in football. Legacy – Kyler’s father, Kevin, played QB for Texas A&M from 1983-1986, re-writing the record books along the way. In 1986, he rallied the Aggies to a 31-30 victory after falling behind Baylor 17-0 in the contest Texas Football Magazine later voted the best game of the decade. To follow in his father’s footsteps and play at A&M would be another milestone in the promising career of Murray. After committing in May of 2014, holding true to his verbal despite all of the outside noise would look great for him. Murray will succeed at whatever university lands his services, but only A&M can offer the opportunity to launch touchdown passes into the end zone for the same school as his father once did years ago. Baseball – Haven’t you heard? He plays baseball too. Murray will be a two-sport athlete whether he chooses Texas or Texas A&M, that much has been decided. He became the first athlete to ever be named an Under Armour All-American in both baseball and football. Both schools have great programs, so it really is a push in this category. Head coach Rob Childress is in his 10th season with Texas A&M with NCAA regional games a regular occurrence. That being said, baseball is more of a threat than a bonus when it comes to the services of Murray. The outfielder has a strong shot at going in the first round which could spell disaster for both universities come June if he chooses to turn pro in baseball. 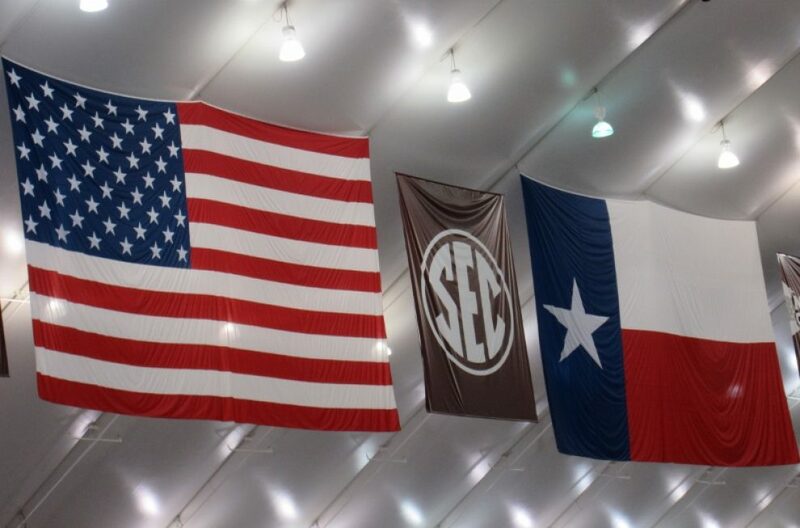 If college ultimately wins out, a combination of newly-renovated Kyle Field and Blue Bell Park at Olsen Field playing host to your athletic abilities is hard to turn down. Interest in the person more than the player – Lots of promises are thrown out towards the end of January in college football. The most notable rumor during the Murray recruitment as of late is that head coach Charlie Strong has promised him the starting spot at quarterback if he ultimately chooses Texas. If Sumlin has made this same promise to Murray, it hasn’t leaked yet. He has however been all in on Murray since the start, and isn’t attempting to use all of Murray’s buddies as an incentive to swing the QB to the degree Texas has done. Murray has the talent to start in college. That much goes without saying. At Texas, it appears it will be handed to him. As for A&M, he will have to earn that opportunity with his play, not his name. In short, A&M offers Murray the ability to truly develop his game. The Aggies have a pretty strong success record with freshman QB’s over the past few years and there is no reason to believe that won’t continue. The important thing to remember is that should be a decision made by the head coach when a player is ready, not used as an incentive to possibly lure a young QB into a situation that may not be the best for him long term. SEC. SEC. SEC. SEC. – Call it biased if you wish, but there’s a reason ESPN can’t stop talking about the Southeastern conference. If the goal for Murray is the NFL, Texas A&M is the school to choose. The exposure of the SEC combined with playing in a newly-renovated $485 million stadium on national television week after week can boost your exposure rather quickly. Not to mention, the conference championship game provided by the SEC is another luxury the Big 12 can’t provide. As seen recently, the College Football Playoff Selection Committee looks highly upon championship games. If Murray wants to feed his habit of postseason play, the SEC is the conference to choose. Johnny Who? – It’s an interesting concept to think about. How many players arrive to college with so much hype they draw comparisons to the greats before they even step foot on a field? Murray is often referred to as “Manziel 2.0″ on various message boards, but with a higher ceiling. With new defensive coordinator John Chavis joining Texas A&M, the days of needing to score 40 points to win a game will likely be a thing of the past. During his time at A&M, it’s completely realistic to see this team make multiple playoff runs with Murray at the helm. If that ends up being the case, the Heisman Trophy may be heading back to College Station sooner than expected. We all know Amazon changed our lives. I always imagined Orwellian warehouses filled millions of items where programmed robots fetch the ordered item. But there are actually people in charge and people who care about their reputation and your customer satisfaction. Here’s the backstory. Last Christmas I ordered two paperback copies of the book The 100 Year Decision – Texas A&M and the SEC by R. Bowen Loftin with Rusty Burson. The odds of the books arriving in time for Christmas were against me before I even placed the order. I knew Dr. Loftin had self-published the book so the distributor would likely not have a large inventory. Also, the deadline for “arrive by Christmas” was rapidly approaching. Nevertheless, I placed my order and was thrilled to see the seller mailed the package on December 19. Christmas came and went. Then New Year’s came and went. Finally, the books arrived. And now to the present. A about a week ago, I received an email from the seller, Margaret, asking if I would consider removing my neutral feedback. She went on to say she was a small distributor/seller for Amazon and feedback was critical. I suspected the book would be from a small entity from the start because of the nature of the book. Then she offered to return my shipping and handling charges. I found this incredible. Amazon/Margaret was not even the problem, yet they were willing to make it better. Within seconds a credit to my Amazon account was made and a thank you email from Margaret appeared in my mailbox. Thank you Amazon and thank you Margaret for helping to make the world a better place. Now if you will excuse me, I must go order something from Amazon. A great Saturday morning laugh. I usually do not post anything on Saturdays, but since I am waiting for the weather to warm before I hit the golf course, I decided I would. Did you read Bowrag’s blog about naming of children? Made me almost spit out my coffee laughing. When I was a child I walked around for several weeks saying “I’m Tallulah Bankhead.” It never caught on with my parents. I once had a student named “Boy” and a female student named “Seven.” I did not inquire if there were siblings below named Eight or Nine. BFF in Navasota, TPM, once had a set of twins in her class – Dean and Sean (pronounced SEEN). An old family story has some cousin’s family that either ran out of names because there were already so many children or in my family where the gene pool shallows significantly, they probably couldn’t think of a name. But as the story goes, the child, a girl, was called Baby until her twelfth birthday. As her birthday gift she was allowed to pick her name. She chose Mattie. Back in the day when email communication first began among educational entities in the late 1990;s (now doesn’t that make you feel old?) it was the job of one of my colleagues to check submitted email addresses for accuracy and other reasons perhaps undetected by the requestor. For example, Carol Ann Jones @network.edu requested her initials C A and her last name Jones. Thus it became cajones@network.edu. Thus her email address translated into Spanish was testicles. And RL had to call her and explain. She was mortified, embarrassed and everything else, and immediately requested something else. I am certain Tula Does the Hula From Hawaii would make data entry clerks cringe with each key stroke.